Home › Blog Entry › Who is paying for SAR in BC? Who is paying for SAR in BC? A better question is, where does the money come from and how is it used? The BC Search and Rescue Association (BCSARA) released a discussion paper last year that effectively answers most of these questions. 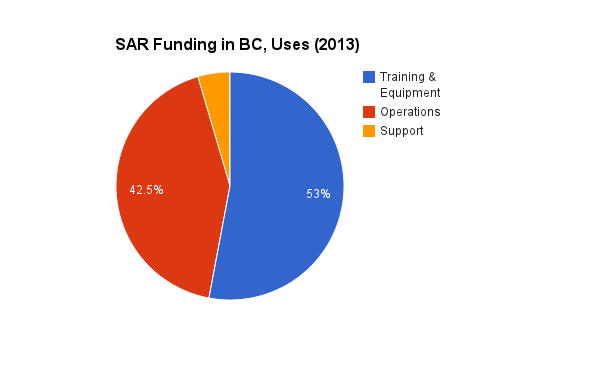 Based on over 10 years of research and analysis, it outlines how much it costs to run BC’s SAR program, and where the funding comes from. It also makes some very serious recommendations on how much money is actually needed to run the program. In this post I’m going to take those numbers and break them down a little bit. First, the table showing where the funds come from. Gaming refers to the BC Community Gaming Grants; any non profit “providing programs or services of direct benefit to the broader community” is eligible to apply for a grant. The money comes from gambling and lottery profits. EMBC refers to Emergency Management BC, the arm of the BC Government that is in charge of Search and Rescue. The “response reimbursement” row indicates that it costs exactly 2.2 million dollars to pay for all SAR tasks in BC. The “other response costs” are the helicopter time, which is a significant bill. “Local Authorities” refers to contributions from cities, regional districts, and municipalities. These contributions are usually to a local community based SAR team. This does not include “in kind” contributions such as buildings and vehicles. “Other fundraising” refers to all fundraising by SAR teams that result in donations from corporate sponsors or individuals. “SAR-NIF” refers to the New Initiatives Fund, a federal grant that is available to the major agencies (BCSARA and EMBC) to fund certain large projects. 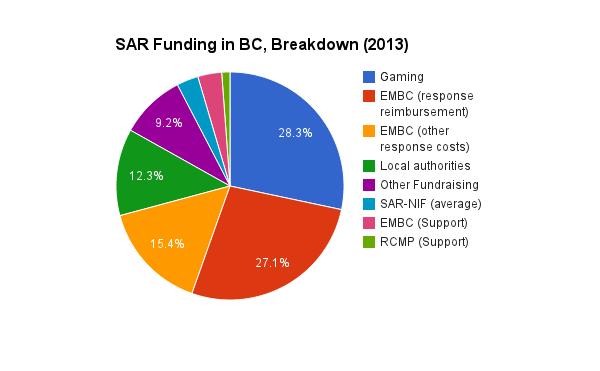 EMBC and RCMP support categories refer to grants by EMBC and the RCMP to BCSARA’s operations. An “Operational” cost is one that is required for a rescue. A non-operational cost is a required cost (training, equipment, maintenance) in order to maintain a SAR team at an operational level. The division is important to illustrate that, while SAR costs are covered by taxes, the money required to keep teams ready to respond is not from taxes, and is not stable, more on this later on. As you can see, gaming accounts for approximately 1/3 of the total, and EMBC response reimbursement another third, with the rest coming from other sources. One thing to note is how small the actual “Other Fundraising” category is – donations fund less than 10% of the total cost of SAR. This chart is intended to give a broad strokes picture of where the money comes from. Almost 60% directly from taxes, 28% from the gaming grants, 9% from donations and 3% from federal grants. An important point to notice in this chart; the money for SAR that comes from taxes is relatively stable — it’s sort of “guaranteed” in that most of it is spent on operational costs – actual rescues and helicopter time. 40% of SAR funding is not stable funding — this is the amount necessary to buy equipment and train volunteers. It seems like a crazy system to pay for the rescue side of things from taxation, yet leave the preparedness of the volunteers to themselves. SAR groups have to individually raise funds through gaming grants and donations to make up this portion of the pie. This last chart illustrates what the money is used for. I’ve collapsed donations into non operational costs, along with Gaming grants, NIF and RCMP funding. If you were to break this chart down for individual SAR teams, the picture might be different depending on the group. This is a provincial perspective. It’s also important to note that this doesn’t include SAR assets currently owned by SAR teams, which are estimated at 7.8 million – most of which are operational requirements (vehicles, equipment and buildings). Approximately 40% of the entire cost of SAR in BC is not sustainable because each team in BC scrabbles for donations and grants to fill it in. As can also be seen from the grants, donations only account for 10% of the SAR funding model, and are another part where a SAR team must spend time attempting to attract the attention of the media and the local population in a sort of popularity contest rather than spending time training or managing the team. A distraction to say the least. While this money is appreciated and essential, it does not fund SAR. 90% of SAR funding is from government controlled sources, taxation, local governments, or government agencies. “Sustainable long term funding” from the public would mean quadrupling the amount of donations, and sustaining the effort at maintaining that level of engagement. This is frankly impossible. This effort from volunteers who would be better off spending their time training so they can actually rescue someone safely and effectively, something that takes a lot of time already. SAR is an essential public service. Unlike other service clubs, if we are under funded it will result in ill equipped SAR members, and a lack of safety. If we are serious about sustainable, stable long term funding for SAR then the only way is to ask your MLA, Council member and MP to prioritize funding for SAR through guaranteed annual grants. British Columbia is a world class tourism destination, with amazing wilderness. Our Search and Rescue system is the envy of many other jurisdictions in Canada and elsewhere in the world. There are some simple steps we can take to improve it, and one of them would be to recognize the essential nature of the service. 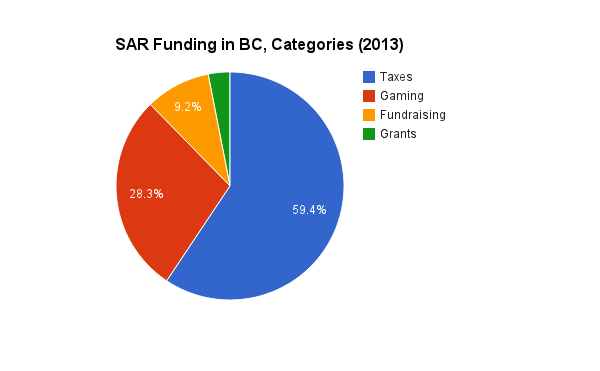 If the gaming grants were a guaranteed chunk of money from the same source, distributed on a needs basis it would improve SAR in BC immensely. Help me better understand your comment under EMBC funding source: “it costs exactly 2.2 million dollars to pay for all SAR tasks in BC” — in reading through the rest of the article, does this mean “actual rescue tasks, minus helicopter costs”? You’re right Charles, it should be 3.45 million including the helicopter rescue costs. In reality it costs the full 8.12 million because none of those rescues would ever take place if there weren’t trained volunteers to do it,. As, as stated in the original paper, if the RCMP had to do it, it would cost 20 million based on an RCMP constable’s wages, but would likely come in closer to 50 million. The discussion paper talks about a SAR fund which I think will pretty much be gaming money. If there is an increase of gaming funding to BCSARA to be distributed to the teams, how do you think it should be distributed? * the current model is that each team puts together a proposal for one year’s worth of funding and throws it in with every other service club in BC to be evaluated on the merits of the proposal alone, and not in relation to the overall need t fulfil the SAR mandate in the province. The evaluators don’t know an ATV from an ATC. Proposals have been rejected because they did not seen the difference between volunteer SAR and volunteer fire for the same community. * the proposed model is that the funding would be allovated from the gaming funds, and would be guaranteed. Someone with SAR expertise would evaluate the proposals and give them some form of rating. I’ll refer to this as “vetting”. There’s no “formula” proposed for how the money should be distributed. I have not thought about it long enough to come up with a position, but I believe that anything is better than this ad-hoc process that has politicians posing with novelty cheques… and stinks of politics. I would hope for a model that takes into account the needs of a team (needs analysis), possible multi-year projects, pilot projects, research, and the call volume of a team. There would also be priority to address perceived gaps in coverage for technical teams, and to address safety concerns. A good example is WestCoast Inland SAR who lost most of their equipment last year. They should be prioritized to fill the gap, and address safety needs, even though their call volume is rather low. Do you have any ideas on how the model should be structured? Haven’t given this a huge amount of thought either, but I was thinking along the lines of three levels of funding. 1. each team gets it basic funding covered to “keep the lights on” things like insurance, radio licences etc. This amount would vary by team. 2. an amount of money per team for them to pay for equipment and training and any other costs the team see fit. This would be the same (or nearly the same) for each team. 3. Teams could then apply for capital funding for big ticket items. This maybe for a single year or multi year program. A body would vet the applications and prioritize them. Potentially BCSARA could direct funding to safety items. e.g. an amount per person for avalanche transceivers. There are many other ways to cut the pie I’m sure. The other problem with the gaming grant system is that an emergency service is taking money that is actually earmarked for charities. While individual SAR teams are charities, the service they provide should be considered essential. As a result, food banks, kids camps, and community arts programs all loose out on money that was the real intended recipient for the gaming program because $2.3M is paid out to groups who really should be properly funded. Long term stable funding to teams to allow them to plan and grow is essential. As Whistler found out this year, you have to be broke at the end of the year to receive a gaming grant. As a result, every team has to spend every cent they own every year in order to receive critical funding for the next year. It makes it nearly impossible to save up for multi-year projects like a $500,000 command truck or $2M base facility.